Why does it seem as if some prayers work and others don’t? Are we doing something wrong? How do we keep from losing heart and giving up on the very tool God has given us to not lose heart? Bible Gateway interviewed John Eldredge (@johneldredge) about his book, Moving Mountains: Praying with Passion, Confidence, and Authority (Thomas Nelson, 2016). What distinguishes your book from the many others that are available on the subject of prayer? John Eldredge: The disciples watched the prayer life of Jesus and responded by saying, “Teach us to pray.” I think that’s a new idea for most Christians—that prayer is something we learn and grow into and mature at. Prayer isn’t like sneezing; it’s far more like getting married, where love is a good start, but there’s a whole lot more to be learned isn’t there? 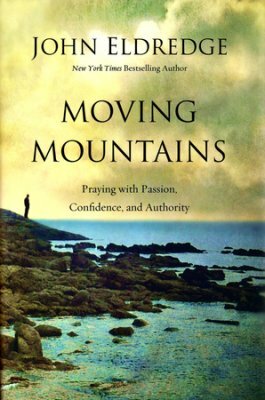 Moving Mountains is different because it is an how-to book on prayer. How do you consecrate your home? How do you pray for the sick? It’s a step-by-step guide to powerful and effective prayer. What is the “zap” view of prayer? John Eldredge: I think most of look at prayer this way: We ask, then wait for God to move. If he is going to move, he’s going to move fast—zap—and it’s done. But that’s not what you see in the stories of prayer in the Bible. It took Elijah eight rounds of prayer to call in the rain that ended the drought for Israel. It took the church in Acts an all-night prayer vigil to spring Peter from jail. In the famous parable of the persistent widow, Jesus urges us to stick with it. If all we do is pray once, and give up—no wonder we don’t see more results to our prayers. What is a more spiritually mature way to think about, and to practice, prayer? John Eldredge: The wonderful view of prayer given to us in Scripture is that prayer is partnership with God. Not just asking and then waiting to see whether or not God moves. God in fact promised the rain, but he told Elijah to pray; Elijah was God’s partner in that project. When Saul is blinded on the Damascus road, Jesus goes to a disciple in Damascus and says to him, “Ananias—I want you to go pray for Saul.” Now certainly the Lord of heaven and earth could just give Saul back his sight—zap—but he chose to use Ananias’ prayers. I think this is so encouraging. It gives us such a remarkable role in what God is doing in the world. What are two basic assumptions that are the starting point for a mature understanding of prayer? John Eldredge: The first is this: God is growing us up. He is deeply committed to our maturity—including maturity in prayer. As Christians we want to stay in simple, “Jesus be with us” prayers. And God honors those…for a while. But then he calls us up into a much more mature approach to prayer. The second big idea is that we live in a world at war. This is a core assumption of the Scriptures—the church is battling evil on the earth. You have an enemy. If we really believed that, we would take prayer much more seriously than we do. We would want to get really good at it. Explain the concept of praying Scripture and give examples from the Bible. Why are so many prayers met with silence from God? John Eldredge: Mmmmm. We need to be careful by what we mean by “silence.” Unanswered prayer has so many booby traps to it—we jump to conclusions like, God isn’t listening. I can’t pray. I am abandoned. None of that is true, according to Scripture. What’s interesting is that in Daniel chapter 10 we are given a dramatic story of seemingly “unanswered” prayer, and it turns out that God in fact was moving, just not at the pace Daniel was expecting. Be very careful how you interpret “unanswered” prayer. Is it enough to simply recite people’s names to God in prayers of intervention? John Eldredge: These are good questions—they illustrate what I was saying earlier about our need to develop a mature prayer life. For example, here—Christians have been taught that repetition is somehow bad in prayer. And indeed, Jesus warns against vain repetition. But the Bible is filled with prayers that keep at it, circle back, repeat the ideas, keep praying—like in the Psalms. In fact, Jesus himself prays the exact same thing three times over in Gethsemane. So repetition is actually modeled for us in Scripture. Let me try and illustrate why—prayer is like chopping down a great tree. If you only give it a whack or two, you’re not going to see results. Thepersistent widow stayed with it, and saw results. If answers to prayers of intervention cannot be guaranteed, what’s the purpose of praying for others? John Eldredge: Because we care; because we cannot sit idly by and do nothing for the heartache of the world. Because Jesus assumes that we will pray. Notice in the teaching before the famous “Lord’s prayer,” he says “when you pray…” (Matt. 6:5-7). James says the fervent prayer of a righteous man or woman is powerful and effective (James 5:16). So the biblical worldview assumes a vital role for prayer. We are not passive observers; we are God’s sons and daughters, here on the earth to bring his kingdom. Pray! Do you think Christians are more concerned with praying for physical healing than they are for strengthening their souls? John Eldredge: Well, when you or someone you love are in pain, it does move you to pray. I understand completely. But too often we wait till then to pray, or we only pray about “crises.” That’s actually very unkind to your prayer life. Don’t wait for huge needs to pray; pray over small things to begin with, so that your faith grows and you get into a habit of prayer. And yes—my goodness—your soul needs care and strengthening, so please pray for that too! How do you respond to people who say its presumptuous to claim conversational intimacy with God? John Eldredge: I reply, “That is what Jesus taught. That is what the entire Bible is about.” Seriously—the Bible is filled with stories of God speaking to his people. Jesus taught four times in John 10 alone that his sheep hear his voice. This idea is all throughout the Old and New Testaments. In fact, in Revelation—after Christ has ascended—he says he stands at the door and knocks, and “if anyone hears my voice, I will come in…” (3:20). Prayer is not a one-way communication; it is not making speeches at God. He wants to speak back. Can you imagine any earthly father never ever speaking to his children? What would we think of him as a father? Learning to hear the voice of God is a critical step in maturity in the Christian life. How does prayer help achieve the goal of union with God? John Eldredge: Life is so distracting. The number one soul-killer is simply how busy we all are. We are a very busy and distracted people. Prayer causes us to stop, and turn our attention to God. The more we linger there, the more intimate the relationship becomes. (Frankly, I think this is one of the reasons for “unanswered” prayers—God wants us to stay with him, linger, and if we simply said quick prayers and walked away, the relationship would never deepen.) Look at the life of Jesus—it’s marked by long periods of getting away just to be with his father. If the Son of God could not live without it, do we really think we can? John Eldredge: I’m glad you asked! I use it all the time for Bible study and research. It’s enormously helpful! John Eldredge: Thank you for allowing me to share a few thoughts on prayer. It really is the secret weapon God has given his people and far too many good folk have given up on it. Bio: John Eldredge is an author of many books—including Wild at Heart: Discovering the Secret of a Man’s Soul and You Have What It Takes: What Every Father Needs to Know—a counselor, and a teacher. He is also president of Ransomed Heart, a ministry devoted to helping people discover the heart of God, recovering their own hearts in God’s love, and learning to live in God’s Kingdom. He lives near Colorado Springs, Colorado.